Mars is the fourth planet from the Sun and the second closest planet to Earth. It is about half the diameter of Earth and the year on Mars is about twice as long as our own. 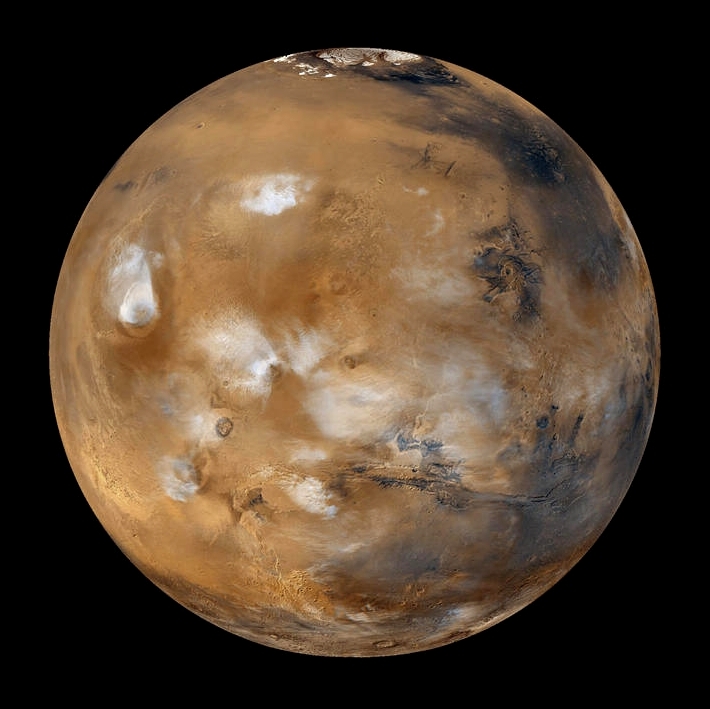 Mars is known as the Red Planet because of its reddish-orange appearance in the night sky. This is caused by iron oxide dust (also known as hematite or rust) on the surface and in the atmosphere. Perhaps because of its red appearance, Mars is named after the Roman god of War. The atmosphere on Mars is about one hundred times thinner than the Earth’s, and consists mainly of carbon dioxide (96%), although there are trace amounts of oxygen and nitrogen as well as water, which forms cirrus clouds. In 2013, NASA’s Curiosity rover mission discovered that soil samples it collected contained between 1.5% and 3% water by mass. It’s likely that Mars had liquid surface water at some point in the past; however, the atmosphere is now too thin to support this. Mars does have large polar ice caps, which consist mainly of water ice – enough to cover the surface to a depth of 11 metres, if melted. It has long been speculated that there might be life on Mars. In 1877, the Italian astronomer Giovanni Schiaparelli said he had seen dark lines on the surface, which he called “canali” meaning channels. However, in England, people translated this as “canals”, which led to speculation that they might have been dug by Martians. Scientists, today, have still not ruled out the existence of microbial life on Mars, although, if it does exist, it is likely to be below the surface. Mars has two small irregularly-shaped moons called Phobos and Deimos, from the ancient Greek personifications of fear and terror, respectively.